A recent study shows that moving houses is polled to be more stressful than both divorce or starting a new job. Do you feel as though you agree? Moving your home is one of the most exciting experiences you’ll face in life, although it can be difficult to enjoy the process as we charge toward that relaxing and comforting reward. Believe it or not, the average person moves 11 times throughout a lifetime and the average weight per move is approximately 6,500 pounds. That could surely add up to a lot of heavy lifting and unneeded worry and stress. Be certain you’re prepared, nothing is worse than a disorganized and poorly planned transition. Fortunately, today, there are many conveniences and a variety of services available that help make moving simple and easy. Regardless if you are moving down the block or across the globe, consider these 6 planning insights to ensure the unknowns are limited and your move is as seamless as possible. Storage units are a big business in America and still growing. Did you know that you could combine three islands of Manhattan and that is still less than the country’s total self-storage rentable space? There is over 2.3 billion square feet of storage unit space available nationwide. If you’re moving long distance, consider packing your stuff and shipping it to your destination. Speaking of shipping, if you already have in mind the things you’ll need for your new space, don’t purchase these prior to your move and then have to haul extras around with you. Simply order necessities online, today essentially anything can be shipped to your new doorstep. From cleaning supplies, unpacking day groceries/snacks/wine, to boxed up mattresses sent by mail, save the hassle of packing the things that will be replaced anyway. Purge your unneeded items. Moving is an ideal time to lighten the packing load. Try to take the time to scale back on items you own that you don’t use or have any need for. 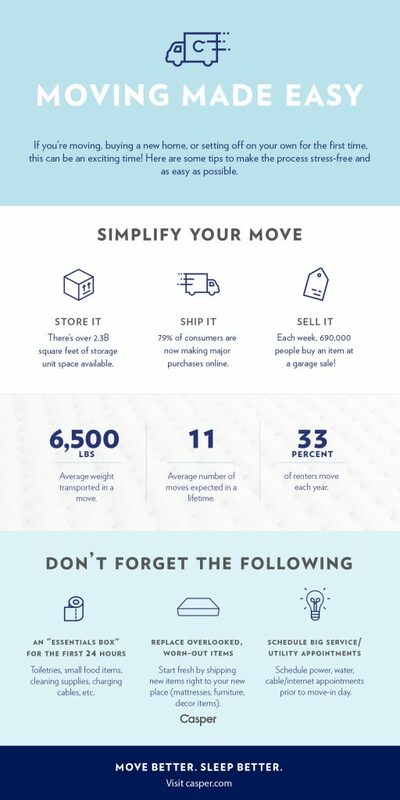 This is a great way to make a little cash for the move while saving yourself from moving extra items. Nothing is worse than needing something and not being able to put your hands on your own belongings. With moving this is a necessary evil. Consider putting together a 24-hour survival kit with the necessary items while you’re in transition. Things like toiletries, cords, valuables, and move related documents. If you plan on buying new furniture or other large items soon, there is no need to bring your old sofa with you for a few weeks. A move is a great time to replace commonly used and overlooked interior necessities. Treat yourself and upgrade your essentials during your moving phase. Perfect planning pays off. When it comes to utilities, you don’t need to wait until you’re in your new home and unpacking to call and set up appointments that will only be projected out a week or two further. Consider getting ahead of the curve and lining up appointments prior to your move, this way the cable guys arrives during the week you already have off for unpacking rather than at their earliest convenience.